We moved into this house in 1999. Two other families have lived here since 1960, the year it was built. 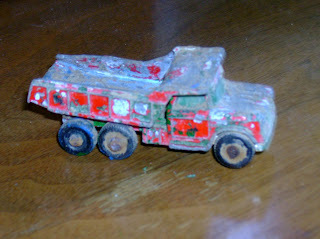 While digging in the garden, I unearthed this little treasure, a 1960's Matchbox Dodge dumptruck, made by Lesney in England. I didn't have the heart to toss it. It reminds me that, even though we own this house, we're just temporary caretakers, really. When and if we ever move, I'm going to bury this again where I found it.